Joanne Keller takes a photo with Sam the Minuteman outside the Keybank Center in Buffalo, NY, on Saturday, Apr. 13, 2019. Photo by Jon Asgeirsson. BUFFALO, N.Y. — Joanne Keller fuels the Massachusetts hockey team. Literally. 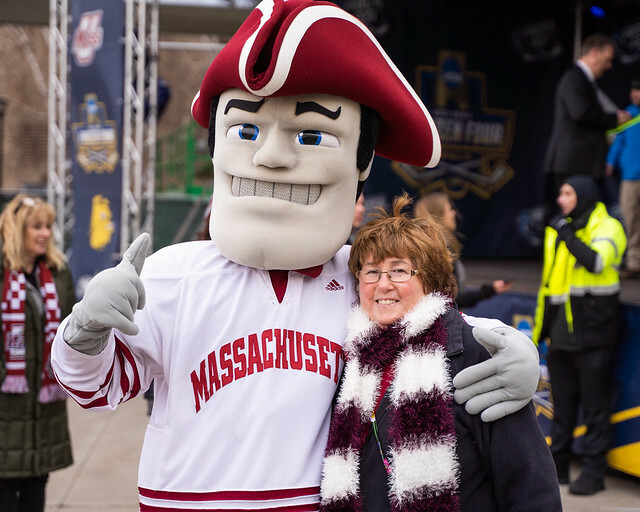 As a cook at Hampshire Dining Commons, Keller has served thousands of UMass students, but none more memorable than the Minutemen she’s come to adore. She even has a special station for them. Players routinely swipe in and head straight to her station to be greeted by a familiar face. Omelets are Keller’s specialty, and a campus-wide favorite, so most of them go that route, but some prefer fried or scrambled eggs. No matter what they ask for, everyone’s favorite ‘omelet lady’ gladly whips it up. Keller’s become especially close with a few of the players and has gone out of her way to do what she can for the team, even outside of the friendly confines of Hamp. “George Mika and Niko [Hildenbrand] and I, we went and had ice cream last year and tried to get some breakfast going on this year, but they’ve been so busy,” Keller said. “I made [a few players] a pie at Thanksgiving because they were all here for Thanksgiving, so I made them a few desserts because they were kind of homesick. From baking desserts for players who couldn’t get home to see their families on holidays to providing the team with the basic energy to start their long days in the classroom and on the ice, Keller really does it all for the Minutemen, and she’s enjoyed every second of their record-setting run. So much so, that she traveled all the way to New Hampshire to witness them advance to the Frozen Four two weeks ago, and then to Buffalo to watch them play on the national stage. On Thursday, when the Minutemen blew a two-goal, third-period lead against Denver to push the national semifinal into sudden-death overtime, Keller wasn’t too worried. On Friday, Keller was at the Hobey Baker Award ceremony, eagerly awaiting the announcement of the top player in college hockey. When Cale Makar’s name was called, it was the end of a long campaign she started months before in support of one of her most loyal omelet patrons. The first, and only, Hobey Baker winner in UMass history is a fan of hers, as well. As a 12-year supporter, Keller has seen UMass hockey during its best and worst seasons. But this one was different from the jump. Saturday night, the Minutemen who frequent her station have the chance to secure their first-ever national championship, and Keller, once again, will be there to witness their quest in person. “I’m really happy for them because they’ve worked extremely hard all season, not only on the ice but off the ice, and they’re great kids,” she said in anticipation on Friday. “They’re in the community helping out others, so they’re well deserving of everything they have. Liam Flaherty can be reached at [email protected] and on Twitter @_LiamFlaherty.